TORONTO, Jan. 3, 2018 – Canada’s fifth largest accounting and business consulting firm, Calgary-based MNP LLP, has announced a merger with an unnamed firm based in London, Ontario. The news continues major changes in Canadian accounting public practice, most notably the December 2017 acquisition of Collins Barrow Toronto by global accounting giant RSM. MNP will create a new region, known as Southwestern Ontario, formed by the London-based firm’s five offices in Arkona, Clinton, London, Stratford and Strathroy. 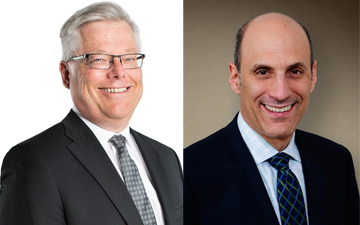 It will be led by Doug Greenhow (pictured above, left), the new MNP Regional Managing Partner, a 36-year veteran of Collins Barrow in London, where he was most recently a tax and managing partner. Now the largest of the mid-market firms in Canada, homegrown MNP continues to build its presence across Eastern Canada. It entered the Ontario market in 2008 and has since added 12 more locations. The new Southwestern Ontario region will build upon the firm’s existing presence in Waterloo, Cambridge, Burlington and St. Catharines, which will form a newly created South Central Ontario region. Due to legal agreements, MNP was unable to provide name of the London-based firm or any details relating to the merger talks. "To maintain our culture, we have been very strategic about who we invite to join our family," said Cole in the company’s press release. "Both our firms' cultures and values are well aligned and we share the same entrepreneurial approach to doing business. It's truly a win-win for both our firms and the marketplace. We are thrilled to have found the perfect firm to join forces with, one that puts clients first." Colin Ellis is managing editor of Canadian Accountant. Pictured above, left, Doug Greenhow, MNP Regional Managing Partner, Southwestern Ontario, and right, Jeremy Cole, executive vice-president for Ontario, Quebec & Atlantic, MNP. Photos provided courtesy of MNP LLP.